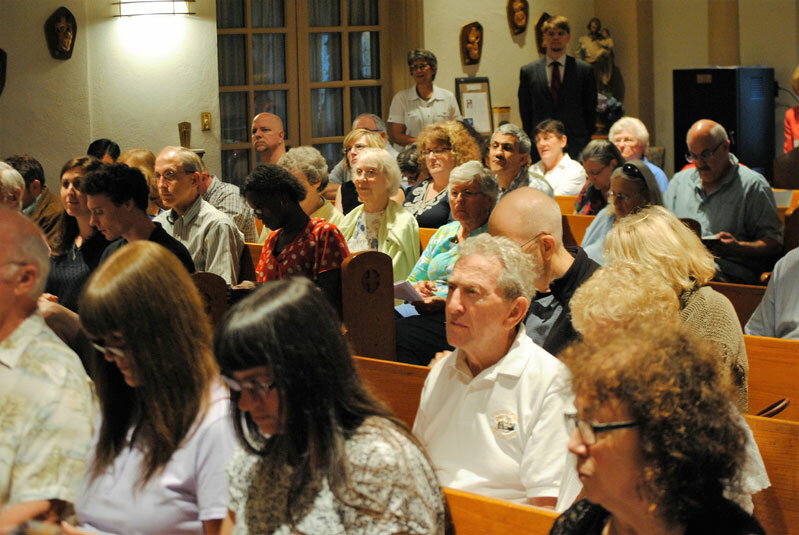 Father Kraft, a native of the Diocese of Allentown now serving Nairobi, Kenya, shared more than a dozen “modern” married saints he discovered during his years of research with an estimated 100 faithful at St. Francis Center for Renewal, Monocacy Manor, Bethlehem. “The biblical examples are certainly perennial in Christian spirituality, but there is often not much to go on in terms of more specific expressions of the challenges of marital life today, such as family planning, formal education, professional ethics, political engagement and social challenges,” he noted. Father Kraft also pointed out that his desire to learn more about married saints stemmed from marriage being the largest vocation in the Catholic Church, leading him to investigate why only 1 to 3 percent of the entire list of Catholic saints are married. “Why such a statistical disproportion, especially considering that the vast majority of Catholic Christians are married,” he said. Although one may wonder that married life may be deficient in the path of holiness or a “trap” to impede full commitment to the Lord, Father Kraft said those arguments are not in line with Catholic teaching. “If that were the true understanding of the Catholic Church, then she ought to abandon her sacramental understanding of marriage. The deficiency is not on the part of Christian marriage as a way of holiness and school of sacrificial self-giving in the Lord’s service,” he said. Even though many Catholics still identify saints with religious and priests, martyrs, mystics and miracle workers, Father Kraft said it is urgent for people to seek the introduction of the cause for sainthood for married Christians, to pray to them and to spread knowledge of their holy lives. “At any rate, even though this inequality of married ‘representation’ in the number of canonized saints may not be intentional on the part of church authorities, it is still lamentable that lay Christians have so few examples of lay and married saints to guide themselves by, in the challenging world in which they find themselves immersed,” he said. In his presentation, Father Kraft revealed details about 15 religious saints, including a 19th century French couple named Frederic and Amelie Ozanam. “Frederic founded the St. Vincent de Paul Society that grew like wildfire. He was a brilliant professor but little is known about his beautiful relationship with his wife,” said Father Kraft. After he was diagnosed with tuberculosis, Father Kraft said, he accepted his impending death at age 40 and called being unable to watch his only child grow as a great sacrifice. “She was his strength, joy and consolation as a spouse,” he said. Frederic was beatified by Pope John Paul II in 1997, and may be properly called Blessed Frederic by Catholics. Another holy couple Father Kraft examined was Felix and Elisabeth Leseurr. On the evening before their marriage, Elisabeth discovered that he was no longer Catholic, but a militant atheist. “She asked him to promise not to make her denounce her faith,” said Father Kraft. Elisabeth, who was eventually surrounded by the anti-clerical atmosphere of her husband’s colleagues and friends, undertook a formidable program of self-formation in the Catholic faith. From this time on, she saw her major task in praying for the conversion of her husband, while remaining patient with his constant attacks on her faith. “She studied Scriptures, teachings of the pope and prayed for him, but he remained firm,” said Father Kraft. After Elisabeth succumbed to cancer, Felix received a journal she kept about her faith and beliefs. “He was bowled over by her faith and he came back to the church. He later became a priest and fostered her cause for canonization,” said Father Kraft. 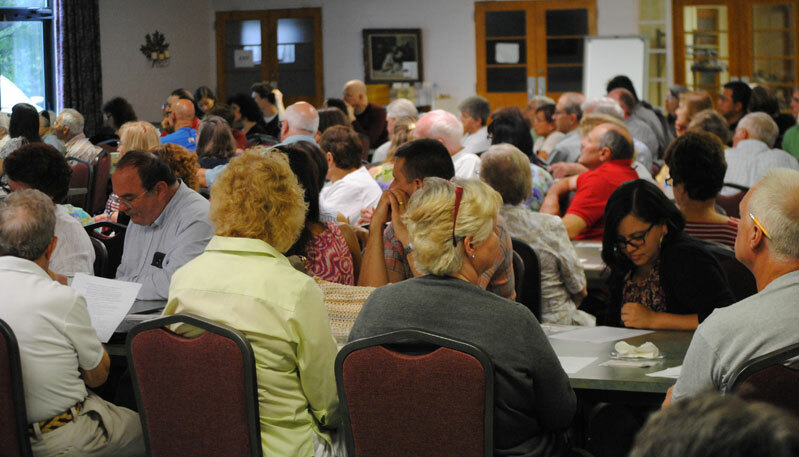 In addition, Father Kraft highlighted the lives of Enrique Shaw and his wife, Cecilia Bunge. “Enrique and Cecilia entered into marriage with a full awareness of the sacred vocation of matrimony. They inaugurated a lifestyle very different from that of their social class, based on Gospel values,” he said. “They were a wealthy couple who lived their Catholic faith profoundly. He was an extraordinary CEO of the family industry. They had a total of nine children, and both parents cared for them with great attention to their medical problems, education and faith formation,” said Father Kraft. Shaw, who was a marine in Argentina, began a business at the end of World War II and established the Christian Association of Business Executives in 1952. He also co-founded the Christian Family Movement and served as president of the Argentine Catholic Action. In 1955 he became a victim of anti-Catholic persecution under the administration of Juan Peron. He was arrested and seen as an altruistic prisoner as he provided fellow inmates with mattresses that relatives brought to him as well as food. In 1961 a firm he led was sold to an American trust fund that decided to fire over a thousand people. Shaw was opposed to this and proposed a plan to retain all workers. One of his initiatives was the application of Catholic social doctrine in the workplace. He also paid attention to the social teachings of Pope Pius XII in 1946. At that same time he served in an organization for humanitarian aid for post-war Europe. According to his daughter, he would not accept dinner invitations from friends because he wanted to spend that time with his children. Shaw also taught his children the importance of rosaries and took them to church each week. In 1957 he fell ill with cancer and in 1962 received a blood transfusion donated from his fellow workers. Shaw himself said before his death that he was pleased that the blood of his workers coursed through his veins. He died Aug. 27, 1962 in a hospital in Buenos Aires. His beatification process began Sept. 25, 2001 and he was conferred a Servant of God in recognition of the process. The process received formal ratification in 2015. In addition, Father Kraft looked to the exemplary life of Catherine de Hueck Doherty and her husband, Eddie Doherty. The couple founded the “Madonna House” a world-wide fellowship of spirituality and ministry. Catherine was born in Russia Aug. 15, 1896 to wealthy and deeply Christian parents. Raised in a devout aristocratic family, she grew up knowing that Christ lives in the poor, and that ordinary life is meant to be holy. At age 15 she married her cousin, Boris de Hueck. Soon the turmoil of World War I sent them both to the Russian front: Boris as an engineer, Catherine as a nurse. The Russian Revolution marked Catherine for life. She saw it as the tragic consequence of a Christian society’s failure to incarnate its faith. All her life she cried out against the hypocrisy of those who professed to follow Christ, while failing to serve him in others. “She was a noble woman dedicated to evangelization and to serving the poor,” said Father Kraft. Catherine and Boris became refugees and for years she experienced grinding poverty as she labored to support her ailing husband and child. After years of painful struggle, her marriage to Boris fell apart and the union was annulled by the church. She married American journalist Eddie Doherty in 1943. Together they established the Madonna House community on April 7, 1954. The house serves as a family of Christian lay men, women and priests, striving to incarnate the teachings of Jesus Christ by forming a community of love. Along with other members, the couple took a promise of chastity and lived celibate lives thereafter. “They lived their Christian vocation as a happy couple in the context of a community of consecrated men and women,” said Father Kraft. Pierre and Juliette Toussaint were Haitian-born slaves, Pierre was brought to New York City by his owners in 1787. There he eventually gained his freedom and became a noted philanthropist to the poor of the city. The couple performed many charitable works. Among those works included opening their home as an orphanage, employment bureau and a refuge for travelers. Pierre contributed funds to build St. Patrick Cathedral, New York. In 1996 he was declared “venerable.” Toussaint is the first layperson to be buried in the crypt below the main altar of the cathedral. Louis and Zélie Martin, parents of St. Theresa of Lisieux, lived an extraordinary conjugal and family life. They were beatified together as a couple and were canonized in 2015 during the Synod on the Family. Pancho Armida and Conchita Cabrera de Armida were a couple from Mexico. Conchita received mystical revelations and founded five religious congregations. Franz and Franziska Jägerstätter were an Austrian peasant couple who criticized the Nazi regime. Takashi Nagai and Midori Moriyama were a Japanese Catholic couple. He was a pioneer in the science of radiology in the colony of Nagasaki. The atom bomb killed Midori and left Takashi a widower with terminal leukemia to raise their two children. lived an ordinary family life extraordinarily, were first couple beatified together in the history of the church. Taha Hussein and Suzanne Brisseau were an interfaith couple. She was Catholic and he was Muslim. They both profoundly respected and intuitively understood each other’s faith. Each remained a practicing, convinced believer in their own religion. Albert John Mvumbi Luthuli and Nokukhanya Bhengu both were teachers in the Congregationalist mission in Africa. Luthuli was a 20th century pacifist freedom fighter in apartheid South Africa and the first African to receive the Nobel Peace Prize. Gianna Beretta and Pietro Molla were an Italian couple who desired a large family. While carrying her fourth child she was diagnosed with uterine cancer. She died a week after giving birth in 1962 and was canonized in 2004 with her husband and three surviving children present. Marcello and Anna Maria Inguscio, both born in the 1930s, were attracted to the same service work in favor of the handicapped, though of different churches. Before marriage they each studied for a full year the other’s faith tradition, after which she freely decided to become a Catholic. Cyprien and Daphrose Rugamba, a Catholic couple that overcame many marital problems, were founding members of the Charismatic “Emmanuel Community” in Kigali, Rwanda. They worked for national reconciliation in the early 1990s. They were among the very first victims of the genocide, together with six of their children, who were accosted in their family chapel where they were praying. The couple is in the process of beatification. Faithful reflect on the Book of Ruth during reflection in the chapel at St. Francis Center for Renewal, Monocacy Manor, Bethlehem. 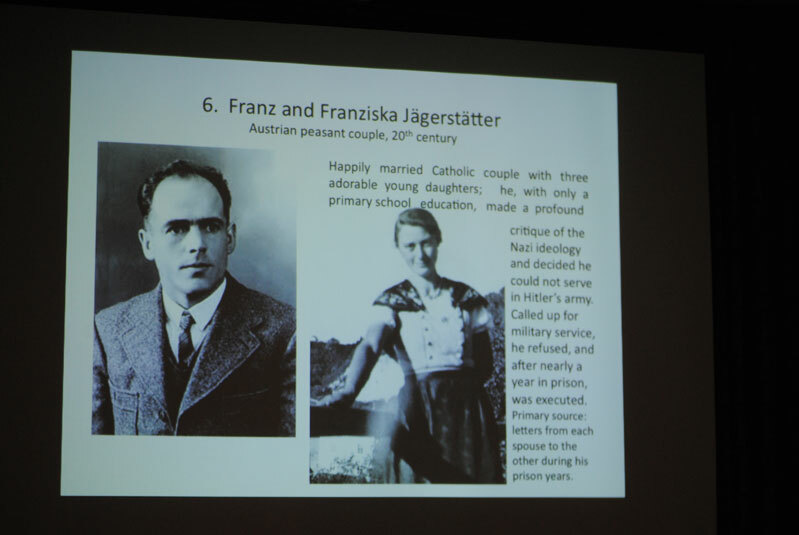 A slide displays Franz and Franziska Jägerstätter, a happily married couple who criticized Nazi ideology. Franz was executed and declared a martyr in June 2007 and beatified in October 2007. Those attending listen to details about conjugal spiritual lives of 15 married saints.